Home :: What is pachinko? Many people in the United States are not familiar with the game of pachinko. But in Japan it is considered the number one national passtime. Pachinkos are everywhere in Japan. 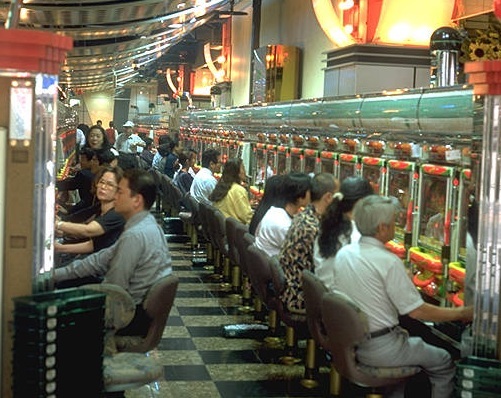 Each year, over 30 million people play pachinko games in Japan. That's right, over 30 million. Combined, they put over 300 billion (that's billion with a B) dollars worth of balls into the games, and lose an astounding total of over 40 billion dollars annually. As a passtime, it is certainly number one. As an industry, it more than doubles that of auto production. What is this game, and what is it that drives such a huge number of people to play? The game of pachinko is played on Japanese machines sometimes called 'Pachinkos'found in thousands of parlors in Japan, similar to the casinos found in the United States. A pachinko machine has a vertical playfield enclosed in a case. It typically has around 200 brass nails, or "pins" in the playfield. It uses a large number of small balls, often numbering in the thousands. These balls are "rented" from the establishment, and redeemed for prizes when the play concludes. The player fires balls individually into the machine with a flipper, which then bounce down through the forest of pins. If the balls go into certain pockets, a payout of additional balls is triggered. Antique pachinko machines are strictly mechanical, but vintage machines often use 10VDC to power jackpot and ballhopper-low lights. Modern machines use a knob to fire the balls, and are fully electronic with video screens and a wide variety of jackpot conditions and payouts. Visit Japan and you will be amazed to find that pachinko parlors are everywhere. Although there are the huge casino-like parlors that seem more like resorts, there are also thousands upon thousands of smaller neighborhood pachinko parlors. These smaller parlors typically hold around one hundred or so pachinko machines, although sometimes they hold as few as thirty. They are licensed by the local governments, and are generally required to donate around 3% of their profits to various charities such as bicycle or motercycle races. Pachinko parlors are often considered gaudy and garrish by United States standards, and are intentionally so. They tend to use bright clashing colors and oversized signs with unusual images to lure customers into the door. Blinking LED displays, strobe lights, bright neon, or combinations of spinning signs and flashing images all mesh together in a sort of carnival sideshow display. Inside the music is almost deafening, with a mix of Japanese military marching songs, techno beats, folk songs, American disco, and every hour or so the theme from the movie "Rocky" will pound through the speakers. Many also mix recordings of pachinko games being played, adding the crackling sounds of thousands of steel balls slapping glass. Flashing lights and blinding colors are inescapable, and the whole experience is one of sensory overload and excitement. A thick haze of smoke fills the air from the constant cigarette smoking of the patrons. Pachinko parlors filled with pachinkos truly are an experience like no other. The first thing to understand is that you need to rent some balls to play this game. The balls are a way of keeping score, and they are your winnings. You go to the counter and in exchange for your currency you are given a tray of bright steel balls, usually around 250. These balls are each engraved with insignia or characters that identify these balls as belonging to the particular pachinko parlor you are in. You then select a pachinko machine to play, and load your balls into the tray. Using the flipper or knob, launch the balls into the game in hopes of triggering winnings or jackpots. The balls you win are released into the tray to be either removed from the machine or fired back into it. Often players will have stacks of filled trays behind them waiting to be "cashed in", because in general the machines will pay out more balls than you put in. Once you are ready to leave, you signal one of the attendants to assist you. They always wear bright yellow jackets, so they are easy to find, and they will carry your winnings for you to a second counter. The second counter will have a machine called a "jet counter" that will collect and count all of your balls for you, and they will issue you a slip indicating how many balls you had. Newer halls have jet counters without attendants that you can operate yourself. You cannot turn this slip back into currency... directly. Around this counter will be display cases filled with prizes. These prizes range from pencils to cigarettes, from dishsoap and perfume to CD's or books. It is generally a very ecclectic selection, and each can be purchased with a certain number of ball credits. What no one will tell you though, is that these prizes are also markers of a sort. There is always a place on the same block as the pachinko parlor where you can take the prizes and exchange them for cash. This is done to circumvent the gambling laws, and the practice is both understood and fully ignored by all authories everywhere. Just keep in mind, players are forbidden to ask where the prize exchange location is, they are required to find it themselves. While pachinko parlors in Japan bare some similarity to American casinos, there are some rather striking differences. The behavior of players is one area where the two diverge severely. Even though the parlors are often crowded, the Japanese consider playing pachinkos to be a personal and solitary game. They do not tend to want to be disturbed or bothered by other players. Many players find the game of pachinko an escape from the constant requirement of being in communications with people around them. It is a way to tune out the rest of the world, and just not have to think about anything but the little shiney balls flying around. If you wish to leave a machine to use the restroom, or to get a snack, just leave a box of cigarettes or something similar in the tray, and that will in effect "reserve" the machine for you for around 30 minutes. Also, remember never to touch another player's pachinko balls, this is considered to bring very bad luck, and it can sometimes be considered a personal insult. If you see a ball on the floor, you are expected to notify an attendant to have it removed. This practice evolved from a superstition, the idea that removing it will prevent it from "infecting" a machine with bad luck. The following list is a sample of the prizes that you can expect to exchange pachinko balls for in the halls. The number of balls usually required is shown in parenthesis beside the item.